The style is Colonial Bungalow, with Queen Anne features such as the cutaway bay with sawn brackets. The 1½-storey house has a steep bellcast, hipped roof with a dominant bellcast dormer over a now-enclosed sleeping porch. The front façade has a shallow angled bay on the right, a recessed porch and front door on the left, in a full-width verandah, now enclosed. The verandah and dormer both have chamfered posts. The transom window on the bay features art glass, with a matching window on the inner entry. The original sash windows have horns. The house has a surprisingly large footprint. The main floor is covered in double-beveled siding, while the basement and stairway walls are shingled. Side-facing steps access the verandah. The right side has a full-height box bay, with a hip-roofed dormer above; there is a matching dormer on the rear. On the left side is a side-facing back door near the rear corner, with front-facing steps. There are two tall, corbelled chimneys. Lewis Street forms an intimate streetscape where the houses are built in close proximity to the street with no sidewalks or boulevards. The one-block long dead-end street is connected to Menzies St to the east by a narrow walkway known as Brotchy Lane and to Luxton Avenue to the west through a small playlot. The street was named after the well-respected Capt. Herbert George Lewis. 1908-10: 39 Lewis Street was built by first owner William Henry Knight (b. Cornwall, ENG, c.1884). William married Jennie (née Beatty, Toronto, ON, c.1883) in New Westminster in 1904. 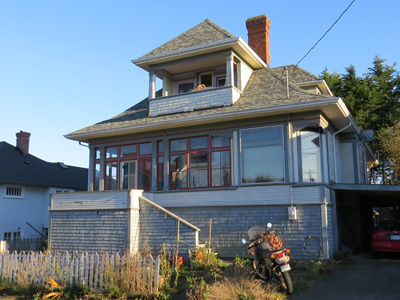 William also built 1560 Gladstone Av Fernwood, where they lived from 1905-08 while William worked as a bicycle manufacturer. The Knights lived at 39 Lewis for two years before building an Edwardian Vernacular house at 149 Medana St.
1911-47: William Stephen (b. London ENG, 1878-1947) and Hanna Caroline (née Brandon, ENG, c.1878-1945) Brown were the owners. William came to Victoria in 1899. He spent two years in the navy as a ward room steward. 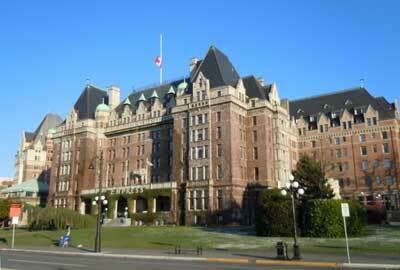 During his early years in Victoria he was employed as a waiter and then chief steward at the Pacific Club in the Yarrow Building. Hannah arrived in Victoria in 1905 when she married William in Vancouver. In 1915 William enlisted in the Armed Forces at the age of 37. He returned by 1918 and spent the rest of his career as an insurance agent. His last job was as annuities representative for the Canadian Government. William and Hannah had two children: William James Charles (b. Victoria, BC, 1907-87) and Ethel Hannah (b. Victoria, BC, 1909-92). Ethel worked as a stenographer for the BC Government. William James started out as a bookkeeper for Cameron Motors and then became an agent with his own insurance company. Both lived at 39 Lewis until their father’s death in 1947, when they moved to 21 Wellington Av in Fairfield. 1949-52: Don B. and Kathleen Sharp were the occupants. Don was an accountant at BC Cement. 1953-c.60: Jack and Rea Vanderbyl were the occupants of the house. Jack was employed as an orderly at the Royal Jubilee Hospital and then as a waiter at the Empress Hotel. During the 1980s and 90s this was the home of Carole James and her family. Carole served as a Trustee on the Greater Victoria School Board before becoming the leader of the BC New Democratic Party from 2003-10. She has been the MLA for Victoria-Beacon Hill since 2005.